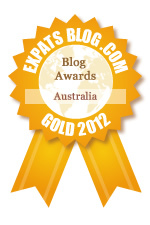 ExpatsBlog.com Expat Blog Awards 2012: Australia Gold Award! This is an awesome blog, practical, fun and fantastic giveaways. Excellent blog and very interesting as well ! Please continue !!! Love this blog, always a great read with so many wonderful recipes! Great recipes and fun to read. This is an amazing blog. A French friend that I haven't met yet. Authentic and insightful. Recipes that are delightful. Awesome blog with a variety of helpful information and very friendly! Love this Blog, fun, practical and healthy. I do really appreciate Mademoiselle Slimalicious who has brought up loads of great blog posts, which helps me a lot for my daily life. A really great Mademoiselle ! Very nice and cute blog ! I love it ! Mademoiselle Slimalicious has lots of great ideas with a realistic and personal outlook, I love her blog! I love Mademoiselle Slimalicious! Her blog is light and fresh and always a great read! Have been following this blog for more than a year, really enjoy it! Fantastic blog always a enjoyment to read and insightful too I must add! love Mademoiselle Slimalicious' blog, so informative and easy to read! Great blog! I really enjoy reading it. Keep writing Mademoiselle Slimalicious! A great favorite. I am a subscriber, so that I don't miss a thing. I love Mademoiselle Slimalicious, a great blog and an informative and interesting read! Thanks! Mademoiselle Slimalicious is a fab blog, full of great articles, advice not to mention the lovely giveaways! i just love the blog and the information Mademoiselle Slimalicious gives us she gives us competitions and advise and there is always something for you to read from blogs to recipes to tips and advice i just love the Mademoiselle Slimalicious site and recommend it to all my friends and family! Love to read the perspective of a French girl living Down Under! The blog is full of good tips!Keep up the good work. This blog is fantastic. A great read with lots of great givaways. The tips that are given are easy, busy life friendly and simple. Great job! This is a 5 star blog. Definitely a blog with a difference that fills a unique niche in Aussie blogs by being a little different in approach and style to all the rest. Very well done! Your blog is inspiring and we can tell how passionate you are about France when you share about your culture. Excellent blog with a different perspective. super interessant, instructif et parfois drÃ´le. De bonnes recettes, simple Ã lire, bref, j'adore !!! Mademoiselle Slimalicious delivers a lovely piece of France to we Aussies! What a great blog! Love it! Love this inspiring & down-to-earth blog! The ideas, tips & information have been not only useful but motivating to make my lifestyle more healthy & happy! Thanks M. Slimalicious! Very inspiring and thoughtful blog ! Love it ! On adore le blog de Cyndie, Mademoiselle Slimalicious! Elle y partage des informations sur la culture francaise et sur l'Europe pour faire decouvrir aux australiens des choses nouvelles! The best blog in Oz, for sure! Excellent blog. Live the regular, easy to understand health tips. Great work. This site is informative and inspiring for woman like me who loves healthy & yummy life style! Love this blog, it deserves a gold award! Fantastic blog, we love France and the French recipes! A very informative blog, I love its originality and also the gorgeous background! A very good read, I'm a fan! This blog is very informative and it encourages us to live a healthy lifestyle! I love to read Cyndie's blog. Her recipes are easy and healthy and she inspires me to get moving! I want to go travelling next year! Mlle Slimalicious is a great read! Love it! Love Mademoiselle Slimalicious posts! Healthy and yummy! J'adore ce blog! Plein de bonnes idÃ©es et des recettes sympa. Fantastic blog! Have been following for some time now. Always full of helpful tips! This blog is great; a really informative, unique perspective on healthy lifestyles- provides a holistic approach with a French twist! Ms Slimalicious is amazing! Always insightful posts and great giveaways. She is definitely the best!